James & Melissa are Todd’s great great grandparents, the parents of his great grandmother Laura May Ruby. James Addison Ruby was born on July 1, 1850 in Illinois. His parents are Bonerges Franklin Ruby and Mary “Polly” Blakesly. Read about them here. James was the oldest of their 3 children, and he had older and younger half-siblings. Bonerges fought in the Civil War, as did his brothers Milbern J. Ruby, Addison Sparks Ruby, Valentine G. Ruby, Joseph H. Ruby. You can see Bonerges’ Find A Grave memorial here. Bonerges’ great grandfather Peter Ruby II fought in the Revolutionary War and his great great grandparents Peter Ruby I and Anna Catherine Vanderhoven immigrated from Switzerland. I have a booklet titled “Genealogy of the Ruby Family” written in 1926 by Addison Sparks Ruby. Let me know if you’d like a copy and I’d be happy to email you scans of it. October 2017 – A Ruby cousin shared with me that PDFs of the book History of the Rubi-Ruby Families of Switzerland and America by Jay and Ruth Ruby are available here. I haven’t had time yet to explore it but wanted to let other Ruby hunters know that it’s there. Thank you Linda Jones for this tip! Melissa Jane Short was born in 1857. Her parents are Reuben Levi Short & Sarah Blakesley. She was the oldest of their 5 children. Rueben served in the Civil War. You can see his Find A Grave memorial here. On the 1850 US Census, James was a baby under a year old. His father Bonerges was 28 and his mother Polly was 27. Their daughter Sarah was 6. They were farming in Edgar, Illinois. Bonerges’ brothers Asa and Valentine and his mother Susannah were living nearby. On the 1860 US Census, the family had moved to Washington, Iowa. James was 11. His father Bonerges was 38, and his mother Mary Polly isn’t found. I don’t know if they divorced or if she died. Sister Sarah was 16, Amos was 8, and Bartholomew was 5. Meanwhile, Melissa was 3 and lived with her family in Vermillion, Indiana. Her father Rueben was 20 and her mother Sarah was 21. Also in the home was her grandmother Susannah, age 63, and Susannah’s own daughter Susannah, age 11. On the 1870 US Census, Melissa was 13 and for some reason was living with the James Beatty family in Lawrence County, Indiana. Her parents and siblings were still in Vermillion County, Indiana. James, listed as Adisan Ruby, also lived in Hett, Vermillion County, Indiana. He was 20 years old and worked as a farmhand. He lived close to Melissa’s parents and coincidentally he boarded in a home along with the young woman who would become his future wife’s step grandmother. James and Melissa were married on May 30, 1872 in Edgar County, Illinois. Melissa was 14 years old and James was 22. On the 1880 US Census, James was said to be 28 (he was 30) and Melissa was said to be 26 (she was 22). They had two children: Josephine, age 7; and Melvin, age 1. They were farming in Jefferson, Iowa. They had 2 more children: Mettie in 1889 and Laura May in 1884. James died in 1889. His Find A Grave memorial is here. Melissa married William H. Collins in 1892. On the 1900 US Census, Melissa was said to be 47 (she was 43) and her husband William was 48. They farmed in Jefferson, Iowa. They’d been married 8 years and had three children: Etta, age 7; Goldie, age 6; Daisy, age 5. Also in the home was Laura May, age 15. Melissa and William had two more children, daughter Olive in 1897 and son Hans in 1899. Both died in 1899. On the 1910 US Census, Melissa was said to be 53 (and she really was!) and her husband William was 56. Their children in the home were Etta, age 18; Golda, age 16; Daisy, age 14. Melissa’s son from her first marriage, Melvin Perkins, age 32, also lived with them. Melissa died on February 25, 1916 in Knowlton, Iowa. Her Find A Grave memorial is here. Sarah Josephine Ruby – Sarah was born on March 12, 1873 in Ringgold County, Iowa. She married Hans Larson on April 15, 1897 in Ringgold County, Iowa. Hans had been married and had 5 children. Sarah and Hans had 6 children. She died on April 14, 1915 in Ringgold County, Iowa. Her Find A Grave memorial is here. Harrison Melvin Ruby – Melvin was born on January 7, 1879. He didn’t marry and was a laborer. He died in 1930. His Find A Grave memorial is here. Mettie Ruby – Mettie was born in February of 1881. She married Henry Clay McConnell and they had a daughter. Mettie died in 1940. Her Find A Grave memorial is here. I posted a picture of Mettie here. Laura May Ruby – Laura is Todd’s great grandmother. Read more about her here. Etta Belle Collins – Etta was born on December 16, 1891 in Ringgold County, Iowa. She married James Milo Nott on August 27, 1913 in Polk, Iowa. They had 6 children. She died November 3, 1954 in Seattle, Washington. Golda Agnes Collins – Golda was born on September 21, 1893 in Diagonal, Iowa. She married Merle Fogelman on November 26, 1913 in Ringgold County, Iowa. They had 12 children. She died on April 24, 1955 in San Francisco, California. Daisy Collins -Daisy was born in 1894. She married Jess Moore on November 28, 1912 in Ringgold County, Iowa. They had 6 children. Daisy gave birth to her last child in March of 1926 and died prior to the 1930 US Census. Olive Gale Collins – Olive was born April 23, 1897 and died in July 1899. Her Find A Grave memorial is here. Hans Alfred Collins – Hans was born on July 26, 1899 and died in August 1899. His Find A Grave memorial is here. This entry was posted in Perkins Family History and tagged Addison Sparks Ruby, Anna Catherine Vanderhoven, Bonerges Franklin Ruby, Civil War, Daisy Collins Moore, Etta Belle Collins Nott, Golda Agnes Collins Fogelman, Hans Alfred Collins, Hans Larson, Harrison Melvin Ruby, Henry Clay McConnell, James Addison Ruby, James Milo Nott, Jess Moore, Joseph H. Ruby, Laura May Ruby Perkins, Mary Polly Blakesly, Melissa Jane Short, Merle Fogelman, Mettie Ruby McConnell, Milbern J. Ruby, Olive Gale Collins, Peter Ruby I, Peter Ruby II, Reuben Levi Short, Reuben Levi Short & Sarah Blakesley, Sarah Josephine Ruby Larson, Valentine G. Ruby, William H. Collins by fillinginthefamilytree.com. Bookmark the permalink. 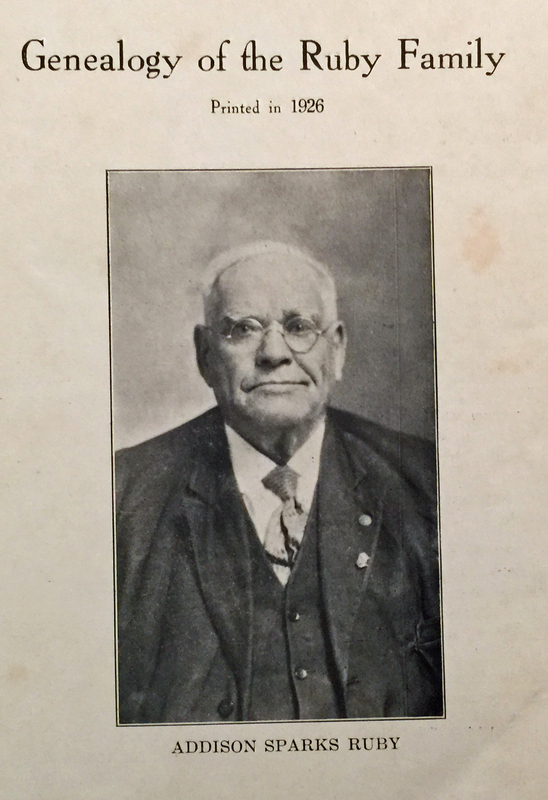 I would like a copy of the booklet – “Genealogy of the Ruby Family” written in 1926 by Addison Sparks Ruby. How much is it? I would be happy to share the booklet by emailing scans of each page. Shall I send it to your yahoo address? I did, in October. You said pages were blurry but you thought it was your computer? I just sent you a link to it on Google Docs. It is compressed. Let me know if this works for you!